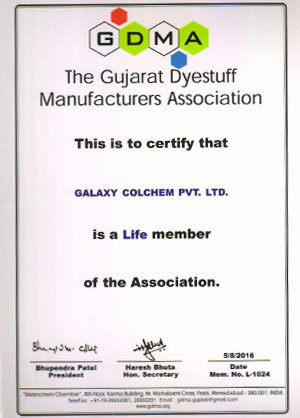 Dyes & Chemicals Manufacturer from India | Dyes & Chemicals Manufacturer from Ahmedabad | Galaxy Colchem Pvt. 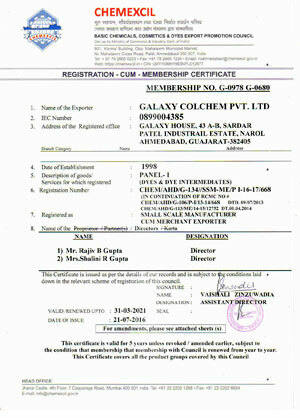 Ltd.
Galaxy an ISO 9001:2015 certified Company is one of the leading names in Export of Dyestuff, Pigments & Food Colors. 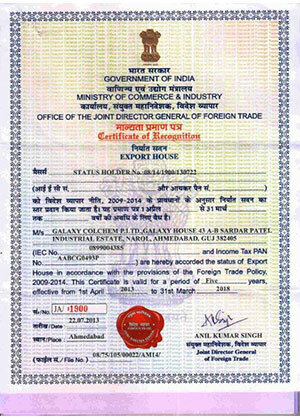 Our Company is “A Govt.Recognised Export House”. 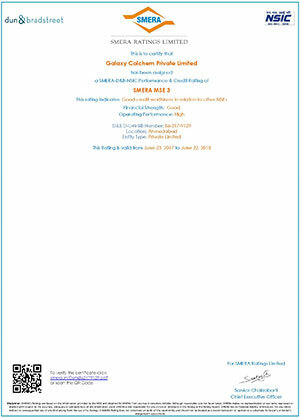 Galaxy manufactures & markets the portfolio of High Quality Textile Dyes for the Cellulosic substrate. Our all products are Eco friendly and Azo Free. 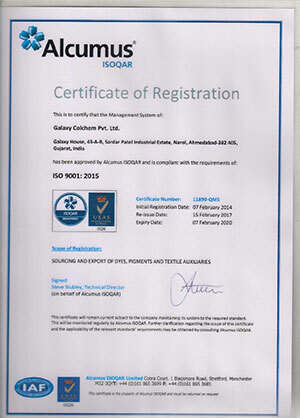 Our products are GOTS certified. The Production Capacity of the Company inclusive of all products at present is 1500MT per annum. Galaxy has earned an excellent goodwill in domestic and International markets as a Reliable and Consistent supplier of Quality products. Our attitude towards customers is not just sales oriented but customer satisfaction is of utmost importance. Our Technical team is always ready to troubleshoot any problem at user end. We believe in Ethical Trade Policies. Customer Satisfaction is more important than profit for us, cherishing business relations with Quality products and services. Nothing is more valuable than safety of our communities. We are equally responsible for the environment in the vicinity of our manufacturing facilities. Adequate measures have been taken in manufacturing process to minimize the impact of surrounding environment.